Founded in 1909, Mutual of Omaha is a mutual insurance company that offers insurance, banking, investments, and retirement products through multiple subsidiaries to individuals and organizations. Best known for its Medicare Supplement plans and life insurance, Mutual of Omaha also owns Mutual of Omaha Bank and was the main sponsor for Mutual of Omaha’s Wild Kingdom from 1963 to 1988. For 2017, Mutual of Omaha generated over $8.6 billion in revenue and holds a $3 billion surplus from 2016. No contact information required. No Pushy Sales People. What Is Mutual of Omaha’s A.M. Best Rating? Currently, Mutual of Omaha holds an A+ rating from A.M. Best, which is one of the highest positions for an insurance company to hold in terms of financial strength. What Is Mutual of Omaha’s Wild Kingdom? Animal Planet later revived the show for a new generation. Wild Kingdom was a redesigned version of the original series, with Mutual of Omaha still being the main sponsor. This version ran weekly from 2002 to 2005. What Does Mutual of Omaha Do? Mutual of Omaha is a insurance and financial services company that provides options for Medicare Supplement, life insurance, employer benefits, annuities, retirement accounts, and other financial products for individuals and organizations. Rated high in customer satisfaction and quality of product, Mutual of Omaha is considered one of the best companies in the industry. What Is a Mutual of Omaha Advisor? A Mutual of Omaha advisor is an insurance and financial services producer (salesperson) that solely represents Mutual of Omaha, much like a State Farm agent only represents State Farm. The term “advisor” is misleading in this industry, as it often means “insurance salesperson,” and these advisors work exclusively for the company they are contracted with. The main issue with exclusive/captive agent situations is that the “advisors” are required to look out for the best interest of the company — which isn’t always in the best interest of the client. These positions are often 100 percent commission sales jobs with required quotas. Who Owns Mutual of Omaha? Mutual of Omaha is a mutual insurance company, which means it is owned by the policyholders. By comparison, a “stock” insurance company (like Allstate) is owned by the shareholders and oftentimes is traded on the public stock market. Where Is Mutual of Omaha’s Headquarters? 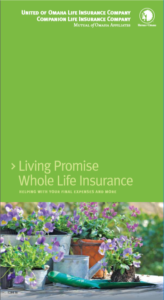 Mutual of Omaha offers affordable term life insurance as well as a host of permanent life insurance products, such as whole life and universal life. Mutual of Omaha provides some of the simplest and easiest term life insurance coverage you will find on the market. As with other life insurance companies, Mutual of Omaha is directing much of its customer base to a simplified-issue type of term life insurance policy to help speed up underwriting time. 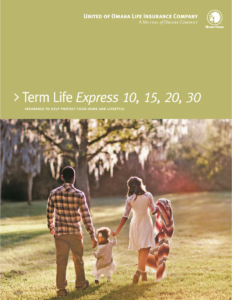 As a leader in the no-exam life insurance product category, Mutual of Omaha’s term life insurance coverage is one of strongest and most customizable term life options out there. To qualify for simplified underwriting, the face amount must be between $25,000 and $300,000. If more coverage is needed, then you have the option to go through the standard underwriting process, which requires a medical exam. This is a standard feature of most every term life insurance policy on the market. This rider allows for there to be a lump-sum payout of 92% of the face value of the policy in the event your life expectancy is 24 months or less because of a terminal illness. For non-return of premium policies, you can tap the face value of the life insurance policy in the event that you have a qualifying critical, chronic, or terminal illness, up to the amount authorized in the policy. Living benefits are great options to have if a serious health issue arises. For example, they can assist in paying for medical expenses incurred in an end-of-life situation. If your main residence receives $25,000 or more in damage, Mutual of Omaha will waive your premiums for six months. If you become unemployed as the result of a qualifying event, Mutual of Omaha will waive your premiums for six months. If the insured dies as a fare-paying customer on an airplane, train, or bus, Mutual of Omaha will automatically provide an extra benefit that is equal to the face value of the policy, up to $250,000, in addition to the policy’s normal death benefit. Additional riders are available, such as dependent children riders and accidental death riders. However, these require an additional premium on top of the standard policy. How Much Does Mutual Of Omaha’s Term Life Insurance Cost? In the picture below, we show you the cost per month for a $100,000, 20-year term life insurance policy. This is for a 44-year-old male non-smoker in average health who lives in Arizona. 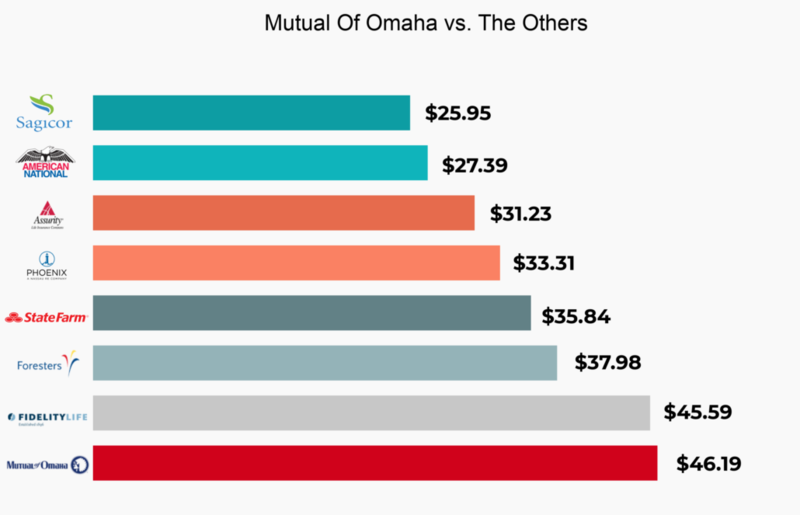 As you can see, Mutual of Omaha is not the cheapest life insurance option when compared with others. This might be because the term life insurance product Mutual of Omaha provides has much better riders built in automatically. Life Protection Advantage is an indexed universal life policy that provides a guaranteed death benefit up to age 85 (or longer), provides flexibility with cash value access and accelerated death benefits, and offers the potential for cash value increases, compared with fixed-interest-rate universal life policies (because the premiums are invested in index funds). Income Advantage offers many of the same benefits as Life Protection Advantage, with a few differences. The Income Advantage policy is an indexed universal life policy, but your money is never invested in the market, and you are guaranteed to receive no less than 0% in cash value growth, which allows for better cash value accumulation. The Guaranteed Universal Life policy is a different type of policy because it focuses on the guaranteed death benefit instead of cash value accumulation. This plan IS NOT invested into index funds, but it still provides excellent flexibility through the use of various optional riders. Mutual of Omaha’s AccumUL is a fixed universal life policy that offers a guaranteed interest rate of no less than 2% per year on the cash value accumulation. This policy has more of a focus on building cash value as compared with the Guaranteed Universal Life option. Mutual of Omaha’s Guaranteed Coverage guaranteed issue life insurance policy is designed for older customers seeking the protection of a life insurance policy for final expenses. This coverage is a graded benefit plan with a maximum face amount of $25,000 for people who are 45 to 85 years old. For people looking for whole life coverage, Mutual of Omaha offers a whole life product with simplified underwriting, which means there is no medical exam and limited health questions involved in securing this coverage. For a whole life policy, the maximum face value offered for simplified underwriting is $50,000 for individuals who are 18 to 85 years old. Customers have the option of working with a Mutual of Omaha salesperson to obtain a traditional whole life policy with better coverage options and higher face values. The downside to these policies is that underwriting often takes longer and a medical exam is required to secure coverage. Does Mutual of Omaha Offer No-Exam Life Insurance? Yes, Mutual of Omaha offers life insurance products that do not require a medical exam. The polices are available in the company’s term life insurance and whole life insurance products. They may have a higher cost when compared with more traditionally underwritten life insurance polices. As one of the most overlooked insurance products on the market, cancer insurance provides coverage for expenses related to the treatment of various forms of cancer. Ten years ago, many professionals saw this type of coverage as more of a luxury than an important piece of protection. Today, given the changes in health insurance, increased maximum out-of-pocket expenses, and rising numbers of uninsured members in the general population, protecting yourself against the financial exposure of a serious illness or disease is more important than ever. Mutual of Omaha’s Cancer, Heart Attack & Stroke Insurance offers protection from the unknowns of one’s future health by providing additional funds to help offset medical bills that can accumulate from the treatment of major covered conditions. Ideal for individuals, families, and small business owners, cancer insurance helps ensure financial peace of mind if a major health event arises. Is Mutual of Omaha Cancer Insurance Worth It? Professionals in the insurance industry are often torn on this topic, so the answer to this question is largely based on who you ask. Considering that health insurance policies today typically have a much larger out-of-pocket limit than policies did 10 years ago, more people are looking at these types of policies as a way to help offset out-of-pocket costs attached to their main health insurance, as well as other expenses not covered by health insurance. Whether cancer insurance is worth it depends largely on the amount of risk you are willing to take. What Does Mutual of Omaha Cancer Insurance Cover? Cancer insurance can be used in a multiple of ways, from income replacement for time taken off work for treatment, the costs of treatments, or to keep your business running in the event of a cancer diagnosis. Depending on the policy you choose, you can either receive the payment in a lump sum upon diagnosis or submit claims based on treatment. What Are the Benefits of Mutual of Omaha Cancer Insurance? The main benefit of a cancer insurance policy is the ability to obtain a lump-sum payment in the event of a diagnosis of a covered condition that is almost guaranteed to be a financial burden. With Mutual of Omaha’s Cancer, Heart Attack & Stroke Insurance product, these benefits pay out to help prevent unnecessary financial stress on the family during this time. How Much Does Mutual of Omaha Cancer Insurance Cost? Mutual of Omaha offers you the ability to easily run a quote on its cancer insurance product on the company’s website. You can also choose whether you want just cancer insurance or coverage for heart attack and stroke, as well. These different options can change the price of the policy. However, the overall cost will be based largely on the amount of coverage you seek. Example: The price quoted for a 37-year-old male in Alabama seeking cancer, heart attack, and stroke coverage was $22.45 per month, per the initial response of the company’s quote page. Learn more about how to protect your finances from Cancer, Stroke, and Heart Attack. Accidental death and dismemberment (AD&D) is one of the cheapest life insurance policies you will every have the chance of owning because it only covers the insured if death occurs as the result of an accident. Because of this, there are no health questions or medical exams to worry about, and a company like Mutual of Omaha has the reputation needed to help you feel confident about your protections. Read about what isn’t covered here. Mutual of Omaha’s Guaranteed ADvantage accidental death insurance can provide up to $500,000 in accidental death coverage and covers you whether death is work-related or not. This policy also offers a return of premium (premium refund) and a 100% increase in the death benefit if death is the result of an accident while you’re a fare-paying passenger on a common carrier (boat, train, bus, or plane). Ready To Get Your Accidental Death Insurance Quote? If you are over 65 or have a qualifying disability like end-stage renal disease, you are eligible for Medicare Part A and B through the federal government. As one of the best companies offering Medicare Supplement plans, Mutual of Omaha provides a variety of plans designed to meet your needs when it comes to helping offset the costs associated with traditional Medicare. However, knowing which one is best for you can be tricky, so we’ve listed the features and benefits of each below. Plan A offers very basic coverage to help make your traditional Medicare policy work better for you. Plan N is the best of both worlds, providing mid-level coverage without sacrificing affordability. Plan G helps offset more of the financial burden of Medicare and gives you a little more control of your health benefits. Plan F is considered the pinnacle of Medicare Supplement plans, offering the best benefits for Medicare recipients. What Is Mutual of Omaha Plan F? Mutual of Omaha’s Medicare Supplement Plan F is on the higher end of Medicare Supplement policies, providing the most coverage of all the plans offered. Plan F benefits include basic benefits, skilled nursing coinsurance, Medicare Part A deductible, Medicare Part B deductible, Part B excess charges, and foreign travel emergency coverage. Is Mutual of Omaha a Good Medicare Supplement? Mutual of Omaha provides some of the best Medicare Supplement policies on the market, without the concerns of provider networks or referrals. Perks of Mutual of Omaha’s Medicare Supplement plans include the overall affordability of coverage and the company’s customer satisfaction rate. What Is Mutual of Omaha’s Timely Filing Limit? When filing a claim for Medicare-related services, the timely filing limit for Mutual of Omaha is one year from the date of service. This is the same timely filing limit that Medicare requires. Does Mutual of Omaha Offer Silver Sneakers? At the time of this writing, Mutual of Omaha does not participate in the Silver Sneaker program. Need more information about Medicare Supplement plans? Contact us today. Created in 1985 under the name Security Federal Savings, Mutual of Omaha Bank was officially renamed in 2007 to provide a level of continuity between customers of the Mutual of Omaha insurance brand and the company’s banking customers. Mutual of Omaha Bank is an FDIC-insured banking institution that provides banking services to individuals, businesses, and community organizations across the U.S. Looking for current rates for Mutual of Omaha Bank products? You can see them here. Read more about the bank’s financial strength here. Is There a Mutual of Omaha Bank Near Me? The best way to locate the nearest Mutual of Omaha Bank is go to the Mutual of Omaha Bank location page. There, you can find the closest bank and no-fee ATM to meet your banking needs. Is Mutual of Omaha Bank FDIC-Insured? Yes, Mutual of Omaha Bank is fully accredited and insured by the FDIC and is also an equal housing lender for its mortgage and home loan products. 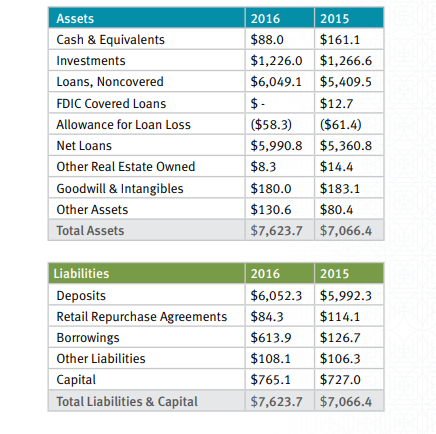 What Are Mutual of Omaha Bank’s Total Assets? Does Mutual of Omaha Bank Offer Mortgages? Yes, Mutual of Omaha Bank offers different types of mortgages, as well as other loan products. Does Mutual of Omaha Bank Offer Accounts for Community Associations and HOAs? Where Can I Find Mutual Of Omaha Bank Reviews? Coverage is great. Price is reasonable. From the use of the policy search and quote service online to the clear and pain-free application by telephone to the notification of approval, True Blue came through with flying colors. My agent, Jason, and all of the staff were consistently caring, knowledgeable, and helpful in every way. I don't see how you could go wrong with True Blue. The whole process was very easy. I received my policy in less than 2 weeks. Fantastic service. Jason was patient and worked with us on every question and concern we had. No real experience yet, but so far, so good! Good experience with wonderful Agent. Once again, my experience with Cheryl was excellent. She helped me find a policy for my son through Mutual of Omaha.. Then once it was all approved, Mutual of Omaha followed up with me and let me know my policy was approved. Overall, my experience with True Blue, Cheryl and Mutual of Omaha was painless and quick. Thank you everyone! Good rates and good service. HVe not heard from them besides my independent agent. However approval was fast and simple! my overall experience was awesome and encouraging. Very affordable and amazing customer service. Very Good. Mutual of Omaha speaks for its self. Approved me for the amount I was needing at an affordable price. Good so far. Only my first month so I haven’t had to call over any issues. Policy required some medical questions be answered. Process was quick and easy and policy was issued. 100% awesome very nice person quick and kind. Jason was the best agent with whom I have ever dealt!!!!! Thank you for providing a life insurance policy that was so easy to obtain. A simple interview by phone took care of everything! Fast in getting insurance approved. Very hard to believe they could not accept my credit card payment. Had to do a bank draw. Should be a very simple transaction. So far so good! I will be a life loyal customer! I am very pleased with my policy and the customer service from Jennifer Plisch. I have only gotten an email stating that I was approved but nothing in the mail yet. They have a pretty good reputation though. Good price point and easy application. We have not really had any dealings yet with the company but the prices are affordable. I would rate them at the top. Mutual of Omaha has been great to work with, good product and good services. Service, information and experience was excellent.